Smoked meats seem to be another food that's popular in Quebec. I passed several restaurants specializing in smoked meat, so I figured I'd try one. I ended up at Joe Smoked Meat in downtown Quebec City. Looking at their website now, it looks like they are a chain. Didn't know that at the time. They had smoked meats served various ways. Someone I ate here with had smoked meat poutine. I decided to go with a sandwich instead and ordered the Assiette Garnie. Out of all the menus in Quebec City, I had the most trouble translating/understanding this one. Because of this, I picked my sandwich mostly because there was a picture of the Assiette Garnie on the menu. The sandwich reminded me of something found in a Kosher style NY Deli. Sliced meat was piled upon rye bread with spicy mustard. Fries, coleslaw, and a pickle were served on the side. I never confirmed for sure what sort of animal the smoked meat was from, but I'm assuming beef. The smoked meat in the sandwich was tasty, but I had the same complaint which I have in the Kosher delis. There was too much meat and not much else going on in the sandwich. Some other flavors would have been nice. I found that Quebec City seems to shut down pretty early. I was looking for dinner one evening around 9:30, and almost everywhere in the Old City was closed or closing for the night. D'Orsay was one of the few restaurants which was still open, so that's where I ate. Because I was in a French speaking province, I felt the need to order French Onion Soup for some reason. The soup here was a bit overpriced. Still, the tasty bowl was filled with salty broth, soggy bread, and topped with lots of cheese. Can't go wrong. I ordered a lamb sandwich for my meal. The sandwich was served on fig bread (according to the menu- I detected no figs). There was a huge mound of thinly sliced, tender lamb between the bread, with lettuce, tomato, and mayonnaise. A mixed green salad and fries were served alongside the sandwich. Everything was tasty and the sandwich exceeded my expectations! For the limited choices of this evening's meal, D'Orsay was a very nice choice! While in Quebec, I had breakfast almost every day at a different bakery. Quebec City has some excellent bakeries and they are all over the city. My first bakery experience was actually in the Montreal Airport while I was waiting for a connecting flight to Quebec City. The restaurant was called Second Cup. It was a coffee shop which sold assorted pastries and sandwiches. I was initially going to get a sandwich, but even in Canadian dollars, the sandwich prices here were insane for something pre-made. The pastries were much more reasonable and I ordered an almond croissant. The croissant was filled with almond paste and topped with slivered almonds and powdered sugar. It was good for airport food, but much better croissants were coming in Quebec City. In Quebec City's Limoilou neighborhood. This was my first experience in Quebec where I felt lost with not being fluent in French. Nobody in here instantly switched to English with my first word of bad French, and I was lost once entire sentences of words I didn't recognize were spoken to me. Turned out nobody working in here spoke English (Yay! It actually felt like International travel! 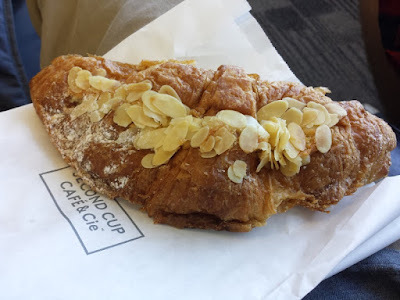 ), but I was able to get the point across that I wanted an almond croissant. It was much better than the almond croissant from the airport. I think I would say La Fournee Bio Boulangerie is my personal favorite restaurant that I found in Quebec City. The bakery items here were amazing. There were pastries, breads, sandwiches, and all sorts of other baked goods. The shelves of deliciousness were perfectly laid out, all looking beautiful. This was another place where very little English was spoken. The employee's very broken English and my very limited French allowed me to order here. Multiple times. I think I ended up here at least four times during six days in Quebec City. Turkey sandwich. This was my least favorite thing here. Stick with the baked goods rather than a pre made sandwich. Brulerie Limoilou was more of a coffee shop than bakery, but they did sell baked goods. I stopped in here upon somebody's recommendation for a snack. I had a grilled ham and cheese sandwich. Nothing was wrong with it, but it was pretty forgettable in the big scheme of deliciousness which was eaten on my trip. It was a bit pricy as well for what ended up being half of a full grilled cheese. I had breakfast at Paillard one morning in Quebec's Old City. I couldn't really figure out if this restaurant was a chain or not, but I definitely got that vibe. The restaurant was doing a huge amount of tourist business. There were very few open tables and they had a constant line. I ordered one of their breakfast combos, which included a bacon, egg, and cheese croissant, fruit, and a coffee. The buttery croissant and bacon resulted in a very greasy sandwich. Still, it was much better than the Tim Hortons bacon, egg, and cheese sandwich. Quebec City likes the circus. All throughout the summer of 2015, the city showed a free circus called Crépuscule in a city park. Crepuscule rivaled, if not surpassed some Cirque du Soleil shows I've seen. As I was watching the show, I couldn't help but notice there was a sign on a nearby building to the left of the stage for Cafe Du Monde. I visited New Orleans earlier this year and sampled the famous beignets at the Cafe du Monde there. I was with someone who had never had a Cafe du Monde beignet, so we decided to see if this was another location of the New Orleans version of the restaurant. It was not. This Cafe du Monde was a fancy restaurant overlooking Quebec City's cruise terminal. It wasn't beignets we were initially thinking about, but a nice dinner sounded good as well. After we were seated, it took me a few moments to realize I wasn't having to translate the menu. I suppose it's a sign that Cafe du Monde was a touristy restaurant if they handed the English menus to the Americans horribly attempting to speak broken French. Out of all the meals I ate on the trip, this is the only restaurant which this occurred. I ordered the Smoked Salmon Gougere. The menu described this as 2 chou-pastry puff with smoked salmon, dill cream cheese, capers, and onions. Smoked salmon seemed to be a fairly popular food in Quebec. I was noticing restaurant after restaurant had smoked/cured salmon of some form on their menu. This was my opportunity to have some of the salmon in the city. French fries were also served on the side. I found it interesting that in almost all restaurants, mayonnaise was offered before ketchup as a topping for fries. I've always preferred mayo opposed to ketchup for fries anyway. Perhaps I've been channeling a French Canadian for my fry condiment choices. We decided to get dessert. Our waitress was very insistent that fried ice cream was ordered. According to her, fried ice cream is a dessert found only in Cafe du Monde. I've seen fried ice cream on menus plenty of other places, including on other menus in Quebec City. Much to her disappointment, I ordered Rice Pudding instead. The rice pudding came served in a huge glass which was probably a foot and a half tall. The server then portioned it out into a smaller bowl with a small pitcher of maple syrup topping. I enjoyed my meal at Cafe du Monde. It was the most expensive meal I had while in Quebec and it wasn't beignets, but everything was good! Tim Hortons is a fast food restaurant that had locations all over Quebec. 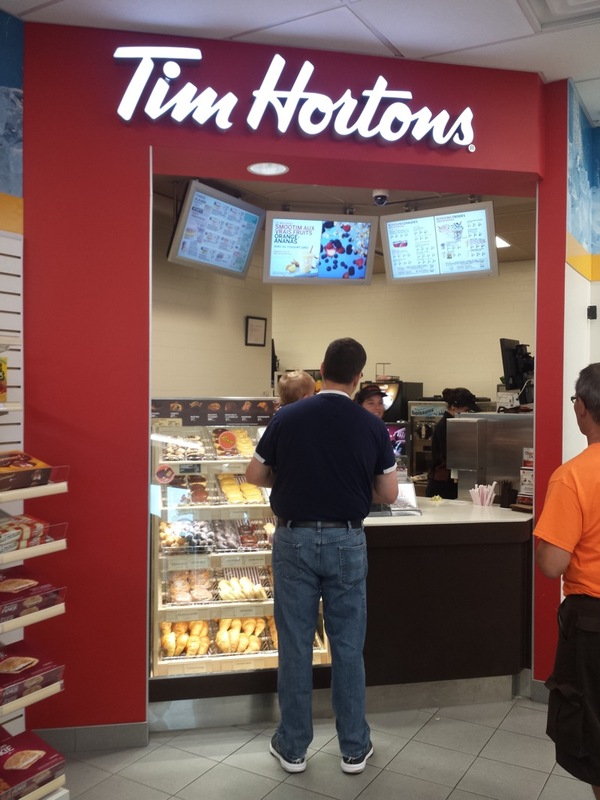 I was told they were the Canadian equivalent of Dunkin Donuts. Because this chain was so prevalent, I decided to see what they were all about. I stopped into a Tim Hortons attached to a gas station in Quebec's Limoilou neighborhood. I also tried a Maple Glazed Boston Creme Doughnut. It was tasty, with a really strong maple syrup flavor. For the last couple days of my stay in Canada, I used some rewards points for a free hotel room in the neighboring town of Levis. Getting back to Quebec City involved a 6 km walk and a ferry ride. On one of these walks, we got hungry and ended up stopping in another Tim Hortons. This location was stand alone and had a much larger menu than the gas station Tim Hortons. I had a Chicken Salad Sandwich, served on a croissant with lettuce and tomato. Again, it was about what I would expect from a fast food restaurant. The chicken salad had a strong mayonnaise flavor, and the croissant seemed very mass produced. I can now say I've tried a Tim Hortons. Being that the chain was bought out by Burger King not too long ago, I wonder if we will see some Tim Hortons locations start popping up in Florida any time soon? While poutine is perhaps the most famous must-eat food in Quebec, another food that I had read about before visiting and came across over and over again in the city was shish-taouk. Shish-taouk seems to be the French Canadian version of chicken shawarma. There were restaurants that specialized exclusively in shish-taouk, and I ended up sampling the dish twice while in Quebec. My first shish-taouk experience was at a restaurant in Quebec's Limoilou neighborhood. They specialized in pizza and shish taouk. Since shish-taouk was on their sign, I decided I must try the Sandwich Shish Taouk. The shish-taouk here was served inside a pita. Accompanying the chicken was lettuce, tomato, pickled turnips, and some sort of creamy sauce. I was a little disappointed with this sandwich. For a food that Quebec is apparently famous for, this chicken was very bland. There wasn't much flavor besides the taste of chicken. The turnips inside the pita were a nice touch, but they didn't make up for the lack of other flavors in the sandwich. Cubed, home fries style potatoes were served on the side. Again, not much flavor on these either. Salt and mayonnaise improved both the sandwich and potatoes. While I wasn't a huge fan of my dish here, the person I ate here with ordered the Poutine à la Joue de Boeuf. Fistons' poutine topped with beef cheeks was awesome. It used sweet potato fries rather than normal potatoes. The beef cheeks were melt in your mouth tender and were bursting with flavor. This Moroccan restaurant was located in Downtown Quebec. According to Wikipedia's article on shish-taouk, the dish is more of a Lebanese origin, but this Moroccan restaurant served it as well. Rather than just trying the shish-taouk, I ordered the combo dinner. This was a sampling of shish-taouk, kefta, merguez, and gyro. The meats were served over rice with sides of taboule, garlic sauce, and salad. The shish-taouk tasted like very flavorful chicken, much better than my previous shish-taouk experience. The kefta was a little bland, basically tasting like ground beef. The merguez was new to me. I had never had a sausage from a middle eastern restaurant in the past. The rice and taboule were nice and flavorful, and the garlic sauce was wonderful. The pickled turnips on the salad were also a nice touch. The shish-taouk was good, but the combination of everything else made this one of my favorite meals of my trip.